President Donald Trump praised a Montana Republican who physically assaulted a reporter at a rally Thursday amid accusations that he is helping Saudi Arabia cover up the murder of a Washington Post reporter. 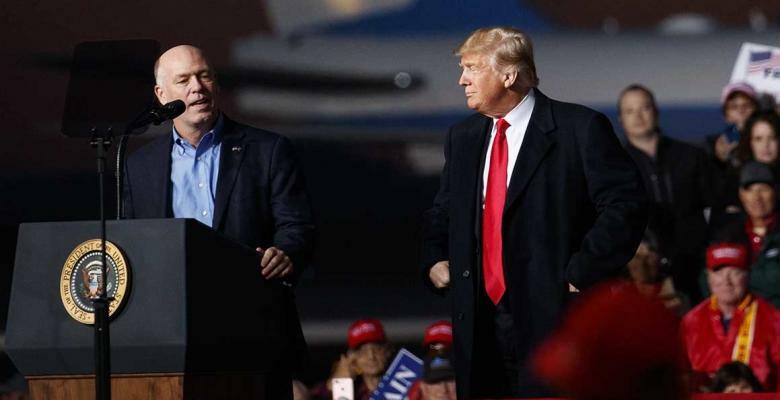 Speaking at a rally in Montana Thursday, Trump praised Rep. Greg Gianforte, who pleaded guilty to assaulting Guardian reporter Ben Jacobs days before his special election win. “He’s a great guy, tough cookie,” Trump gushed. Gianforte pleaded guilty to assault after he threw Jacobs to the ground for asking him about the Republican healthcare plan, though the guilty plea came after the congressman and his staff lied about the incident before a tape of the assault was released. Gianforte was sentenced to required anger management classes. The president praising the assault of a journalist is disturbing enough, but it comes as the president is embroiled in an even more insidious attack on a journalist. Despite mounting evidence that Washington Post columnist Jamal Khashoggi was tortured and killed at the behest of Saudi Crown Prince Mohammed bin Salman, Trump has repeatedly insisted that the leader is innocent until proven guilty and even suggested a “rogue killers” conspiracy theory. On Thursday, The New York Times reported that Trump adviser and son-in-law Jared Kushner, who is known to communicate with the crown prince via Whatsapp, urged Trump to let the Saudi ruler weather the storm. The Washington Post reported that the Trump administration is actively working with the Saudis to cover up the crown prince's alleged role in the murder. “The Trump administration and the Saudi royal family are searching for a mutually agreeable explanation for the death of journalist Jamal Khashoggi — one that will avoid implicating Crown Prince Mohammed bin Salman, who is among the president’s closest foreign allies, according to analysts and officials in multiple countries,” The Post reported. “In a series of private conversations, Trump has reportedly been looking for ways to continue protecting the Saudi-U.S. relationship, fretting about the Saudi investment in U.S. arms, the future flow of Saudi oil and the implications of alienating a country that could help counter Iran’s influence,” another Post report said. While the reported behind-the-scenes discussions are damning, Trump has been equally defensive of his Saudi ally in public, suggesting that he cares more about the arms deal with the country than taking action against a government accused of targeting, torturing, killing, and dismembering a journalist who was critical of their regime. He has compared the allegations against MBS to the sexual assault allegations against Supreme Court Justice Brett Kavanaugh, claiming both should be considered innocent. The New York Times Editorial Board warned that allowing MBS to get away with the apparent murder would send a chilling message to other despots around the world. “If Saudi Arabia is allowed to get away with some lame story about the apparent murder of Mr. Khashoggi, the world’s growing gang of autocrats will feel even less constraint,” the board wrote.